If you are one of those people who don’t eat breakfast owing to several reasons, it is time to change your habit. Breakfast is a nutritious way to start the day and has benefits that last for the rest of the day. Let’s look at some of the benefits of having breakfast. It is no news that if you are hungry you cannot concentrate on anything. If you are at work or school, you will be constantly looking at the clock and counting the minutes until lunch. Having breakfast doesn’t only satiate our appetite but also provides our brain with the essential energy to function and concentrate better on work. It also restores glucose levels that is an essential carbohydrate needed for the brain to function. Skipping meals does not help you lose weight, in fact, it may do the opposite instead. If you miss breakfast, you are likely to end up binge eating and piling up unhealthy calories. A breakfast that is rich in protein and fiber keeps your appetite in check and may help you lose weight. Usually, there is a period of roughly 8 to 12 hours between dinner and breakfast. Therefore, when you eat breakfast, you are breaking a fast from the night before. It is an opportunity to replenish your blood glucose levels. Glucose is our main energy source and is needed to fuel our brain and body. It helps us function properly and fight fatigue. A nutritious and healthy breakfast is a good opportunity to provide the body with essential vitamins and minerals. It is needed by the body for proper growth and maintenance, carbohydrate and protein metabolism, bone strength and a strong immune system. 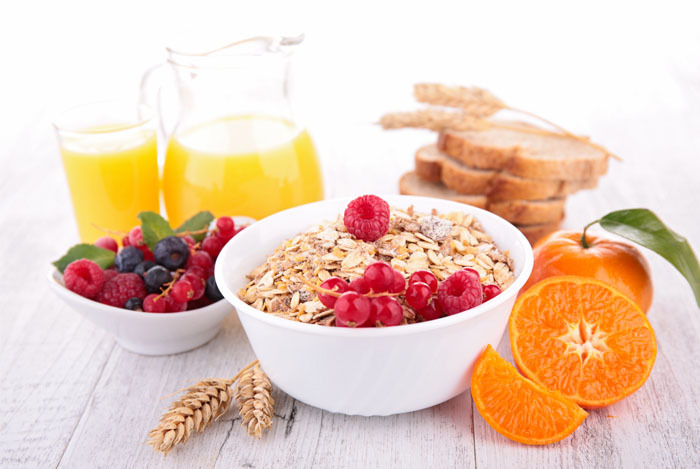 Eating regular breakfast helps meet our daily nutrient requirements, eat less fat and have a lower cholesterol, which may reduce the risk of heart disease. Eating breakfast does not mean having a cup of coffee or tea some junk food. Your breakfast should be healthy and nutritious. Make your morning meal a priority and see the goodness for yourself.